Our home delivery software was designed to accommodate delivery businesses in which customers have a regular “standing order” that may be modified or placed on hold from time to time. Because the Delivery Management System was designed for home delivery businesses that are based on the standing order, we have avoided the “shopping cart” functionality common to many ecommerce-type software packages. The shopping cart pattern has some inherent problems when used for a standing order business, and the Delivery Management System handles these types of recurring sales transactions much better than shopping cart-based software solutions. An extensive array of reports covers all aspects of customers, products, and sales. Printed reports are also used to load product onto delivery trucks, and give stop-by-stop delivery instructions to your delivery drivers. 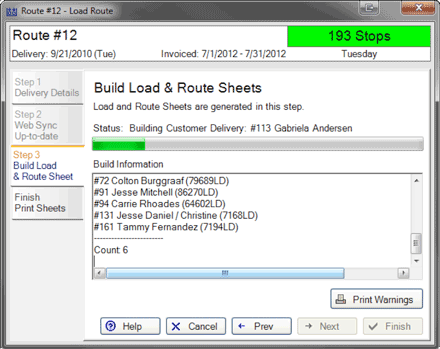 Processing daily, weekly, or monthly transactions is simple and streamlined with the many built-in automated and batch processes included in our home delivery software. Customers have complete control over their desired products, as well as the ability to make changes to their standing order at any time - all from a professional, custom website. Our home delivery software has been designed to take advantage of the best aspects of both online and offline functionality. The desktop office application handles your day-to-day business operations and securely stores all sensitive customer information. Deliveries, billings, and business reporting can all proceed even if your internet connection is unavailable. All changes are kept in sync with the customer website. Your customers will have access to a secure, professional website to manage their standing order and to make changes at their convenience. This will drastically reduce the amount of time your office staff spends with customer support issues. Sensitive customer data, such as payment information, is kept securely offline. Your customers will love the ease-of-use and the convenience. 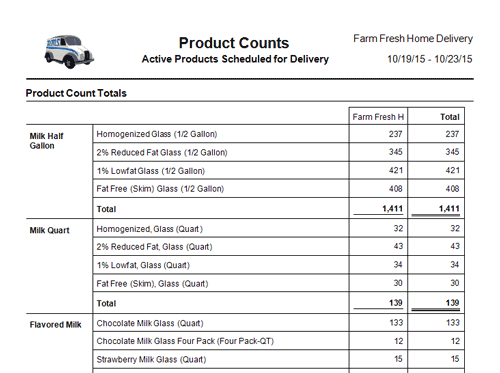 Our home delivery software was built from the ground up with the close support and cooperation of highly experienced and well-established dairy/delivery businesses. 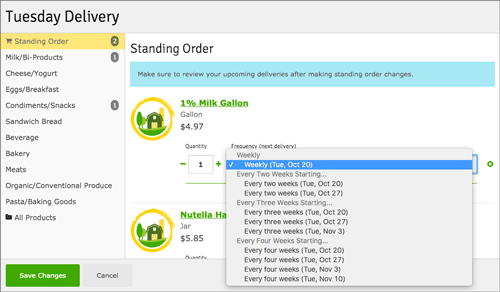 The Delivery Management System started out as a custom software solution that was designed to meet the unique needs of the dairy delivery industry. Over time, the feature selection has been expanded to allow businesses the ability to adapt our home delivery software to their own business practices and processes, and to begin using our home delivery software out-of-the-box without having to build special custom features. The Delivery Management System is ready to meet your home delivery business needs as an off-the-shelf solution, and with minimal setup time. You will get years of custom software development for a fraction of the custom software price. Record payments received, complaints reported, and delivery changes. 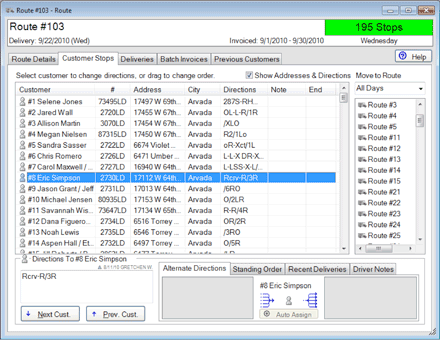 Easily sort and organize customer stops, move customers to other routes, enter special instructions between stops and directions from one house to the next. 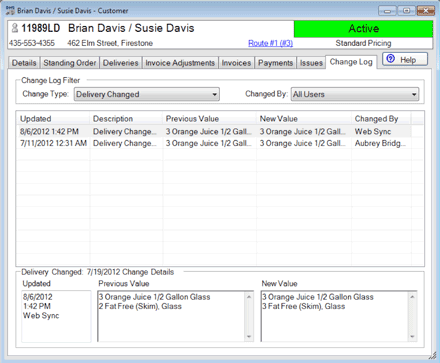 View records of past deliveries, and specify a change in delivery date or change cutoff time. Our home delivery software offers integration with Google Earth, which allows you to visualize customer stops and routes on a map. 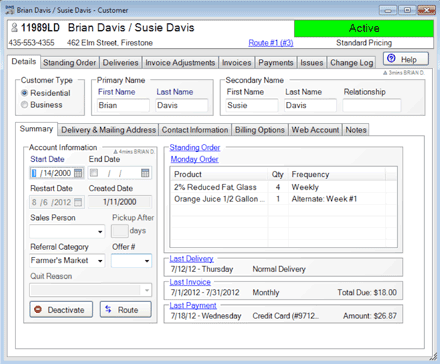 The Delivery Management System has the familiar Windows look-and-feel with easy to use forms, toolbars, and menus. 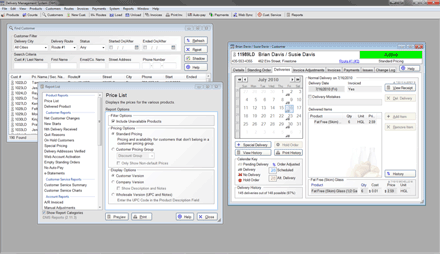 Intuitive drag-and-drop, double-click to open and familiar Windows controls make it easy to use. The Delivery Management System also has integrated ‘Help’ throughout the program to answer questions and help you get the most out of the available features. 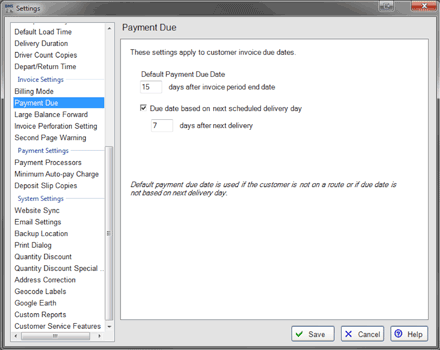 The customer’s complete history is available to you, including payment history, invoice history and delivery history, as well as being able to see when a customer has started or stopped service in the past. There is also a change log that keeps a history of changes made to key pieces of customer data including billing information, contact information, changes made to the standing order and to individual delivery days. You can also view a history of complaints or service issues the customer has reported. 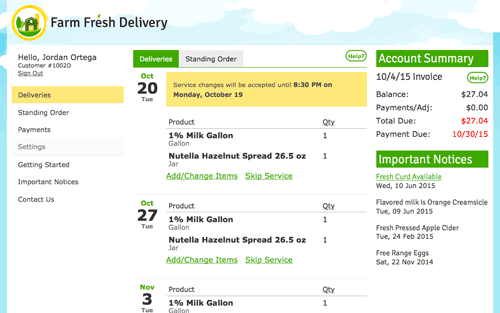 Our home delivery software allows you unlimited ability to customize pricing for your customers. 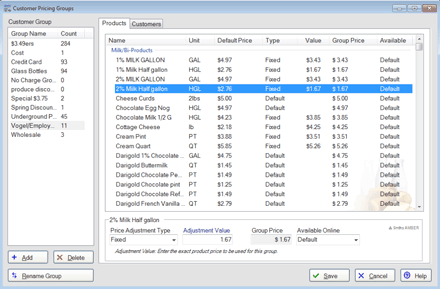 You can create wholesale groups, discount groups, etc, where each group has its own customized pricing schedule, as well as customized product availability settings. Accurate inventory forecasting is essential to success. With the Delivery Management System, you will know your inventory requirements well in advance of scheduled deliveries. 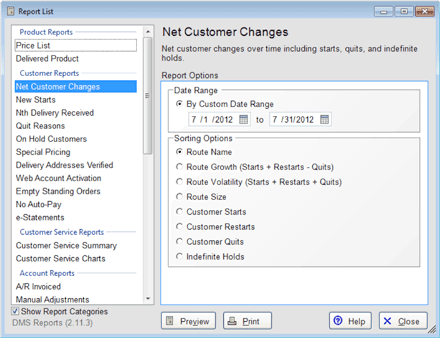 Customer standing orders, adjustments, and deliveries on hold are all taken into account when using the forecasting tool. The tool also notifies you of any warning situations, such as a customer having requested a product that is currently unavailable. Dozens of customizable application settings allow you to fit our home delivery software to your business. For example, you can choose a weekly or monthly billing cycle, or choose to charge a deposit on bottles or other returnable items. You can also choose to make more than one delivery per week. 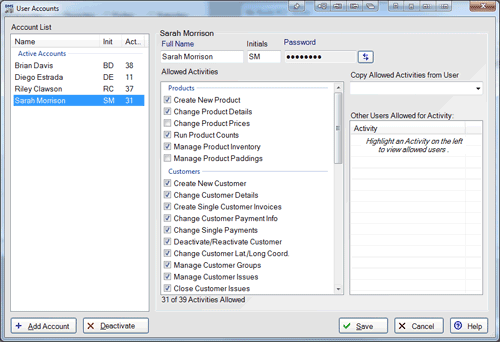 A key feature of our home delivery software is the ability to restrict access to sensitive information by using a structured permissions format for each user. In addition, no sensitive credit card or other payment information is stored on the web, even in an encrypted format. The Delivery Management System is designed to ensure you meet Payment Card Industry (PCI) standards for processing, storing and transmitting credit card information securely. © 2019 MDSC. All rights reserved.